Just removed an important gem from your weapon? Totally screw yourself over by restarting a bloodline instead of the battle you just lost? It sure would be great if you could backup your character so you can always have a safe copy ready to go at a moment's notice. Well, those smart folks over at the Infinity Blade forums have devised a clever way to do this. A quick note before we get started. You'll need an iOS file browser like i-FunBox or iExplorer. For this tutorial, I'll be using i-FunBox on Windows. If you're on a Mac, i-FunBox doesn't have all of the abilities of its Windows counterpoint, so you're better off using iExplorer. You'd be using a different program, but it's the same process on whatever program or operating system you're using. After downloading and installing i-FunBox, go ahead and run it. Once the program is running, you'll notice a file browser on the left-hand side of the window. You'll be using this for navigating through your iDevice. Now, we've got to find the save for Infinity Blade II. Expand the "User Applications" folder to see a list of every installed app on your device. From there, the path is "Infinity Blade II/Documents/SAVE". Here's the easiest part of the entire process. Bring up a new window in Explorer and point it to where you want to keep your backup. 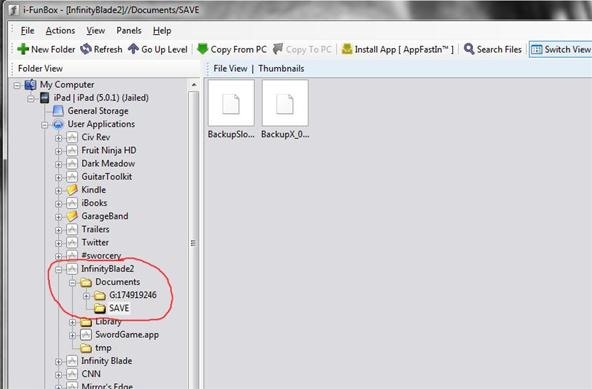 See the folder called "SAVE"? Drag it into the new Explorer window. That's it! Now you have a backup of your character should certain things hit the fan. To restore a save back to your iOS product of choice is just as easy as backing up. Launch i-FunBox and connect your device. 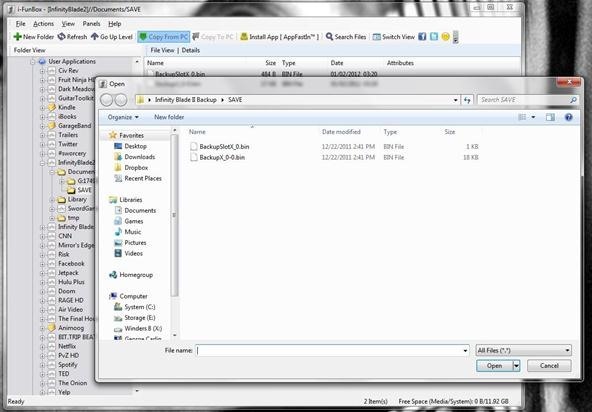 Once it's registered with the program, use the same file path as locating your save. This time, make sure you select the "SAVE" folder, or else this won't work. In the main viewer of i-FunBox, you should see the contents of the SAVE folder. Select in this area of the program the saves you don't want and hit Delete. Now, at the top of the window there should be an option called "Copy from my PC". Click this, and point it to where you saved your backup from Step 1. Select the backup, and your save will be transferred over!